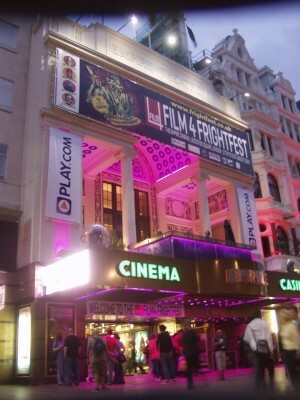 Every year Film4 Frightfest takes over the Leicester Square Empire, straddling the August Bank Holiday, rain or shine, it charges forward, the mass of fans eagerly await that film that will blow them away, force their jaws to the floor and make them cheer. They await great kills, epic revenge, finger clenching suspense, toe curling gore and fantastic creatures brought to life from the pages of Lovecraft. But Frightfest is as much about the films as it is the beers, as evidenced by the presumably gargantuan taking of the Imperial pub around the corner. At the tables inside sit actors, directors, producers, organisers, bloggers, journos, fans and the confused tourist, all sharing pints. Frightfest is the great leveller. Time and time again, industry folk will repeat “This is the best festival I’ve ever been to.” There’s a lack of pretence, egos are left at the door. Between, during and after films, people decamp to the pub en-mass to analyse, debate, deconstruct. For many, it’s the mere fact that here they are surrounded by genre fans, but not just fans, nearly everyone here is an expect. The chance to discuss in depth the films they are knowledgeable and passionate about, doesn’t come often. Watching these films on their own, or with a few mates is the best they can get. Spending five days deep in conversation with creators and supporters keeps the flames alive for many people. and is as much the reason they come as to watch the films. More than a few people buy full weekend passes only to spend the majority of their time, not in L18, but rather supping pints, safe in the knowledge that they can go see any film at any time. Film4 Frightfest has continued to expand, now in it’s 11th year, it’s a massive beast of a festival, with no sign of letting up. Over a year in the making, sifting through nearly 400 feature length submissions and innumerable short films for a coveted slot in one of the most respected genre festivals in the world. Packed with premières, previews, sneak peaks and talent from around the globe, it’s astonishing that a mere four men and a small team of volunteers hold it all together, driven by passion and love. Nearly 40 feature films make the final cut, ranging from comedy horror to pure thrillers and everything in between. It’s not a bloodbath sprayed across the screen, but rather an examination of the full that extreme cinema has to offer. 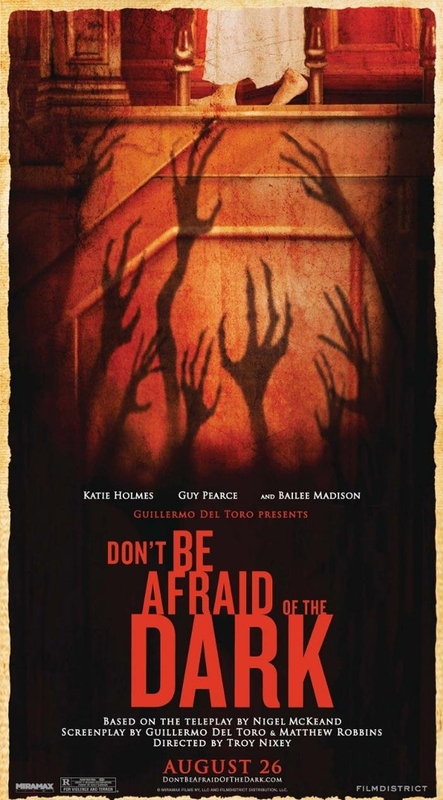 Opening with the UK première of Guillermo Del Toro production, Don’t Be Afraid of the Dark complete with a video introduction from Del Toro himself, apologising for his absence, gives you a sense of the weight Frightfest has. While this remake of a little known 70s TV movie has been liberally sprinkled with Del Toro’s pixie dust, it contains nearly none of the magic of his own features. One cannot be sure how much control first time director Troy Nixey had over this dark fairytale but ultimately with a weak script, he was never going to pull anything to grand out of the hat. Guy Pierce plays career driven Alex, who along with his girlfriend, Katie Holmes, are refurbished an impressive stately home when Alex’s daughter, Sally enters the frame. Ignored and unhappy, she proceeds to dig around said stately old home, unearthing things best left buried. While the original is a tight little 70 minute television play about a couple, Del Toro did a Del Toro-ism and added the child, for without a child, there can be no fairytale. But then again, without characters who behave in rational ways or swarming hordes of little monsters who choose the worst possible times to forget how to swarm, you end up with a fairly flat, forgettable film. Ultimately a golden opportunity frivolously wasted. Well respected distribution company Severin Films deliver their first theatrical production.  Inspired by the Grand Guignol theatre of old, The Theatre Bizarre, is an anthology, six directors, six chapters and a wrap around. 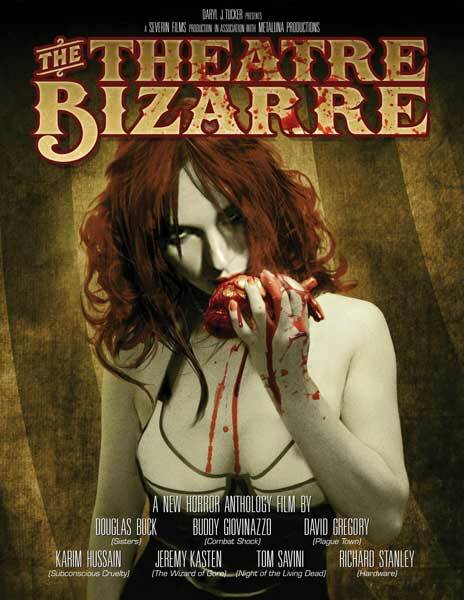 Inherently full of false endings, Theatre Bizarre suffered from a late night slot clocking in at almost two hours, it may have played better when people were more awake. A sprawling list of directors with industry heavy weights such as Tom Savini, the return of Richard Stanley, Douglas Buck, Karim Hussain, and others, this dark dream of a film was filled with pretence and self indulgence. All the directors were given the same budget, 10-20 minutes of running time and a general sense of where to go, and each delivered vastly different product. From cheating husbands and vengeful wives to 4 tittied frog queens, feeders and eye hunting memory thieves there is a lot to behold. Pretension and self indulgence isn’t always a bad thing and The Theatre Bizarre is a great example of art house horror, a fantastic collection of short films possibly not to everyone’s taste, but solid none the less and Douglas Buck’s The Accident may well be one of the most beautiful films to grace the Empire’s screen in a very long time. Actor Cristian Solimeno settles into the directors chair for his first feature length endeavour with The Glass Man. Starring favourite Andy Nyman as a man banging on the door of a mental breakdown and featuring Neve Campbell as his wife. The Ghost Stories star and creator inhabits the sad and pathetic Martin Pyrite, a man who will do anything and everything to keep his picture perfect like look golden for his lovely wife. Entering the frame as a dreaming baby in bed, we follow him through his nightmare existence, fighting an uphill battle to keep his recent sacking and impending financial disaster hidden, we bear witness to his spineless struggles, from office mockery to street side muggings. Pecco played to perfection by James Cosmo, a man of mystery arrives at the door on the eve of a massive blow out with Martin’s beloved, informing Martin that he has bought one of Martin’s debt’s and threatening to take what little the baby has left, Pecco offers him an out “Help me tonight, with this one job, and I’ll wipe the slate clean.” What’s a man to do? 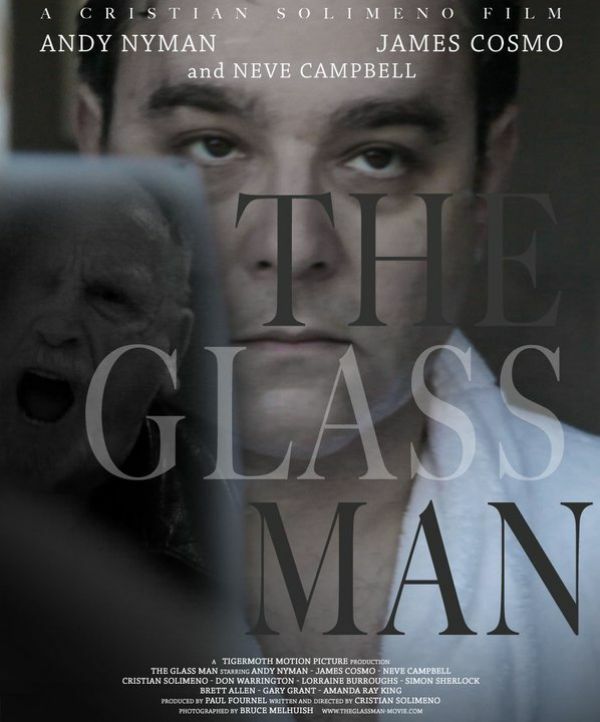 Engaging and beautifully shot, The Glass Man suffers from sloppy editing, a man of vision and framing, with the ability to capture great performances and weave a wonderful tale, Solimeno is in desperate need of an editor. Even after a reported 17 minutes had been chopped out, The Glass Man could lose another 15 easily, and be all the better for it. It seems every year, there’s a film that graces the Frightfest screen that has been languishing in some studio’s back shed because they are not quite sure where it fits in with everything else. This year it was Tucker and Dale versus Evil, premièring at Sundance in January 2010, Tucker and Dale have been travelling from festival to festival in their broken down pick up truck hoping someone would give them the jump start they need. Finally cracking VOD in the US and seeing a DVD/BD release here in the UK at the end of the month. Tucker and Dale v Evil is a masterful send up of the classic hicksploitation genre. Poor, well meaning Tucker and Dale are just after a quiet weekend, fixing up Tucker’s newly acquired cabin when a bunch of obnoxious teens mistake them as maniacal backwoods murderers.While our heroes are out fishing, one of the girls falls in the lake, nearly drowning, Dale saves her and they return her to the cabin to recuperate. The teens mistake this as a kidnapping, in an effort to save pretty Allison, they proceed to accidentally impale themselves on just about everything they can run into, conveniently making it appear as though Tucker and Dale are responsible. 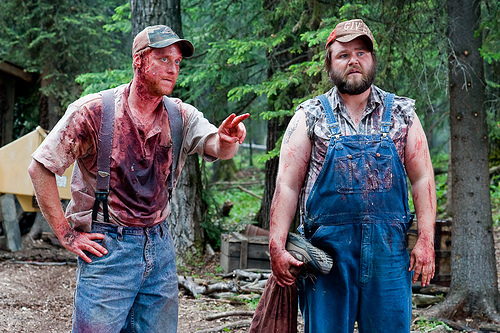 Definitely one of the best horror comedies in years, Tucker and Dale v Evil produces constant laugh out loud moments, in spite of how much one might dislike horror comedy. The Scandinavians seem to be on a roll, producing a steady stream of mind blowing releases, Sweden’s game changing vampire film, Let the Right One In, Finland’s twisted take on the Santa Claus tale in Rare Exports and now Norway corrects it’s minor Dead Sno misstep with Trollhunter. Found footage films seem to be the sub-genre we all love to hate, angry when they are solid and effective, perhaps begrudgingly allowing them a “eh, it’s good.. for what it is.” Digging into Norway’s own folklore director André Øvredal weaves a convincing tale of a trio of noisy student reporters who head out to get to the bottom of a recent spate of mysterious bear attacks and the even more mysterious bear hunter. It doesn’t take long before they find out that the silly stories their grandparents told them were more than just mountain tales. Øvredal manages to avoid the pitfalls of sniveling, terrified, snot nosed actors, instead we have characters we can engage with, and believe in. Not to mention trolls. Trolls of all shapes, sizes and description. Trolls that looks and act every bit the troll of those books you used to read. This is the sort of film the Norwegian tourist board should give out to children, the kids will go mental and desperately beg their parents into taking them to Norway to go troll hunting. sees it’s long dreaded European première. Let’s be honest, this was never going to be good. A story of two evangelical Christians, journeying forth like crusaders to a small Scottish village, just as they are getting ready for their May Day festivals. We knew where this was going before we even sat in our seats. Clumsy, quirky and nearly charming, containing moments of genuine head scratching, sadly, this novel adaptation never manages to pull it’s self up to the level of a Good Bad Movie. Even the inclusion of a Christopher Lee cameo, only succeeds in placing your face in your hands as you ask why. Creating a massive stir upon it’s initial screenings at this year’s Sundance Festival, causing one woman to faint, followed by an outburst of disgust, caught on camera and eventually going viral on Youtube, director Lucky McKee’s The Woman was one of the most hotly anticipated films of Frightfest. 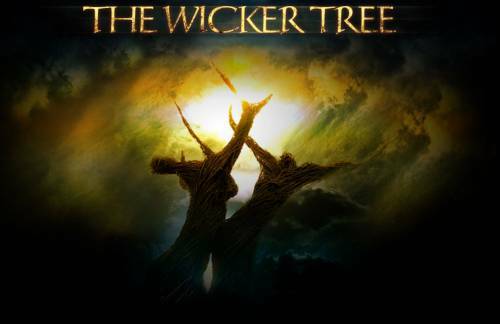 Though not explicitly stated, certainly a spiritual sequel to Andrew van den Houten’s The Offspring, however the connections are more than just tenuous, as both are penned by Jack Ketchum, van den Houten produced The Woman, and Pollyanna McIntosh, the titular Woman, plays the same character in both. McKee, no stranger to acclaim with his first feature May, being one of the secret hits of the past decade, has proved once again, that he’s a force to be reckoned with. The Woman is an entrancing film, sucking you in from the off as we are first introduced to the Woman, a feral beast, living in and off the woods. Upstanding citizen and family man Chris stumbles upon her one day and takes her captive. When he requests that his family clear the cellar up, we already know that he is, without a doubt the Man in the house. Civilising and taming the Woman is Chris’ main priority, he’s done it before and the few times his wife steps out of line, we are swiftly and stunningly reminded that this is not her role. Frightfest does not fail in it’s promise of delivering the cream of the crop with The Woman. This entry was posted in Frightfest, recap, Stuff. Bookmark the permalink.